When we compare them with cars, motorcycles have higher chances to crash, and as the rider lacks the protection of an enclosed vehicle, they are more likely to get serious injuries. the potential injury and trauma to the head can be eliminated by developing a habit of wearing a helmet while riding. A helmet is designed in such a way that it provides perfect cushioning to reduce the impact of the collision and protect the head during an accident. According to recent studies, helmets can be 37 percent effective in preventing fatalities in an accident, a rider not wearing a helmet is 40 percent more likely to get serious head injuries and 15 percent more likely to acquire a nonfatal injury when compared to a person wearing a helmet. Royal Enfield has been successfully manufacturing motorcycles from more than the last 100 years. From the experience they have gained in the motorcycling industry, they know what a rider needs. Royal Enfield is made up of durable and light materials which makes them comfortable to wear and stylish in looks at the same time. These helmets have to undergo rigorous trials and tests before reaching the markets and the certified Royal Enfield stores. 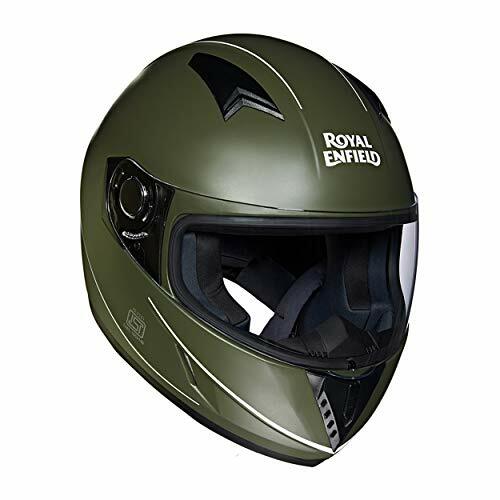 Royal Enfield helmets provide modern safety features and comfort at the same time, the quality standards of these helmets even exceed the regulated safety standards. 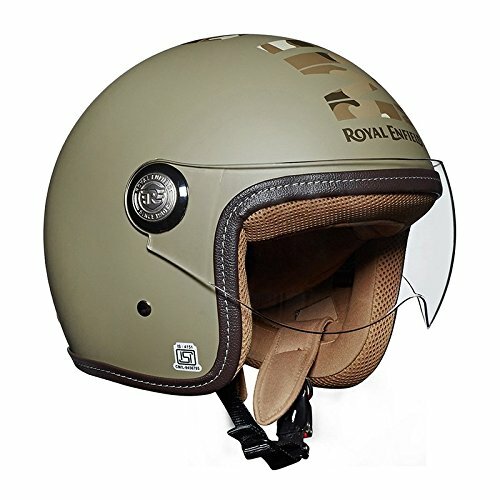 A list of some of the most alluring Royal Enfield Helmets is provided below, along with their key features. If we see from a broad perspective, helmets are generally of two types, the full face -type and the open face type. the design of this helmet is inspired by street helmets of the 60s, this design has a timeless allure but is up-to-date with the modern safety standards at the same time. 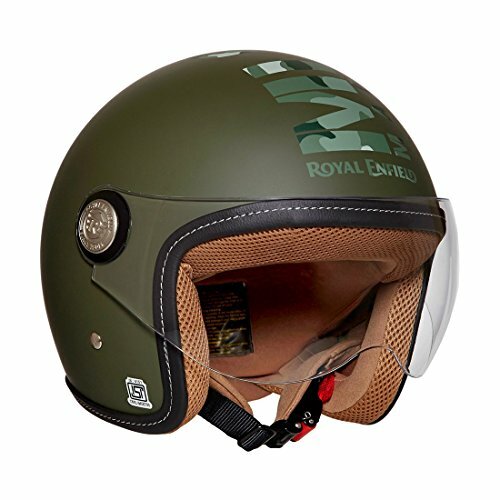 The riders who are looking for a full face helmet with a classic appeal can definitely go for this Royal Enfield product. The helmet weighs about 1450 grams and comes with ISI (IS: 4151) and DOT (FMVSS No. 218) certification of quality and protection standards. The helmet comes with a single unit heat molded ABS shell which is made up of high-grade this helmet features an ergonomic shape and an aerodynamic design. The visor of the helmet is an optically correct aviator style faced shield with micrometric stops which allow you to position the visor according to your preferences. The visor itself is made up of polycarbonate material, which provides it high strength flexibility at the same time. The surface of the visor has a hard coating of UV treatment to increase the ability to resist scratches, that are known to decrease the visibility of the visor. The visor has a screw on release mechanism which allows you to open it when required without taking help of any tools. The helmet has 6 vents for air circulation, 5 of which is for air intake and the remaining one is used as an exhaust port. The chin vent can be adjusted as per the preference of the rider. The helmet has a wide eye port which provides direct ventilation to the face and increases the field of vision at the same time. The comfort liner of the helmet is made up of polyester material and features a knit mesh design for added comfort. The chin strip has a micrometric adjustable quick release chin strap retention system and is made up of nylon material and also have a comfort padding. Some other features of the helmet include a 360 degree hard wearing gasket made up of rubber, which is located at the periphery of the entire helmet. The outer shell of this helmet is made up of high-grade Acrylonitrile Butadiene Styrene and have an expanded polystyrene liner to maximise the strength of the helmet and increase the impact absorption capabilities. The visor is made up of polycarbonate material, and can be easily removed with a twist mechanism. The Expended polystyrene inner lining helps in absorbing shock in case of any accidents and prevent any serious head injuries. An EVA foam mold is used for increasing the protection of jaw. The visor is treated with UV protection to make is scratch resistant. The ventilation is taken care of by an improved ventilation system for superior cooling. The internals is made up of knitted polyester and provides adequate cushioning and comfort to the rider. This helmet has a classic full face appearance and is made up of fiberglass shell, which absorbs any impact and distributes it across a large surface. The air intake ports in this helmet have multiple adjustments, the air is vented in EPS for comfort and cooling. 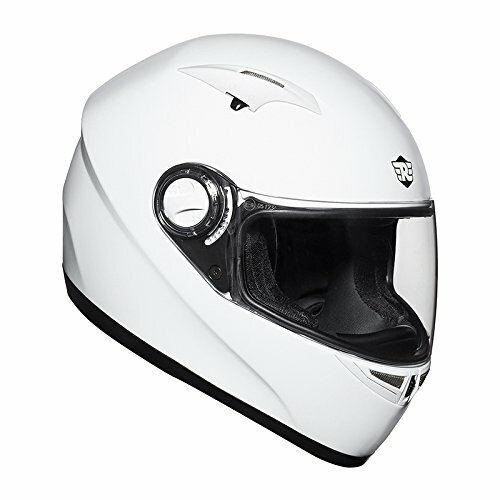 The chin features air curtains which help in reducing the wind flow and noise inside the helmet. The visor used in this helmet is made of polycarbonate to provide it with added strength and toughness. 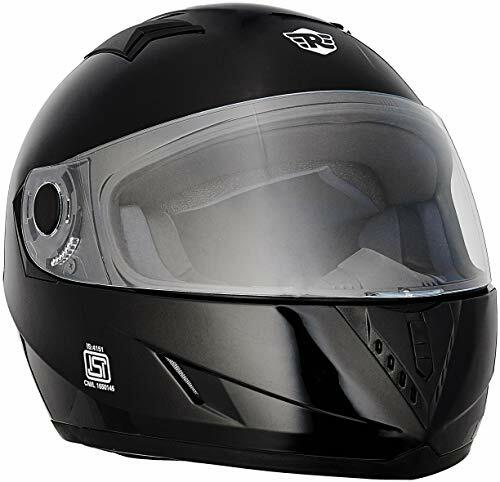 The quality of the helmet is approved by ECE R22-05 and DOT and stands strong on their quality standards. The design of this helmet is evolved and inspired by the popular STREET series, which is a line up of full-face helmets. This helmet is designed to give it the look of the perfect classic styled helmet. It comes updated with the latest comfort and protection features. The helmet weighs about 1400 grams and stands well with the ISI (IS: 4151) and DOT (FMVSS No. 218) certification standards. It comes with a fiberglass shell construction, which provides it superior impact absorption properties. It distributes the force of impact at any point across a large surface area. The helmet comes with an Expanded Polystyrene liner and a jaw protector, a polycarbonate visor with a twist-to-release mechanism. The visor surface is hard coated with UV treatment which makes it resistant from slight scratches. The helmet has 4 vents, three for air intake and remaining one work as an exhaust The vents for chin and forehead can be adjusted as per the preference of rider. The comfort liner is treated with antimicrobial and can be removed and washed easily. It also has a 360 degree hard wearing rubber gasket around the periphery of helmet entry. Here are some of the open face Royal Enfield Helmets, one must try. This is a leather helmet by Royal Enfield. The looks of this helmet make it the ultimate icon of pure motorcycling. The Granado helmet is a timeless icon in the Royal Enfield helmets lines up. The helmet weighs about 950 grams with an error of 50 grams. And the helmet comes with ISI (IS: 4151) and DOT (FMVSS No. 218) certification of quality and protection standards. The helmet comes with a fiber shell construction with a leather cladding. The fiberglass gives it the ability to distribute the impact force on any point of the helmet across a large surface area, this helps In reducing the chances of potential head injury. 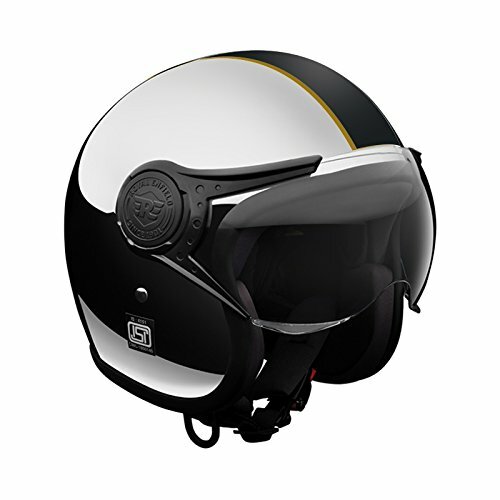 The helmet has a classic design and the leather cladding gives the helmet a sense of vintage aura, the helmet comes with a unique platina pattern to denote its age. The helmet comes with an Expanded Polystyrene liner and a jaw protector. The comfort liner of the helmet is made up of a combination of mesh, leather and polyester internals with an anti-microbial treatment. As the comfort liner is treated with anti-microbial, it can also be easily removed and washed. 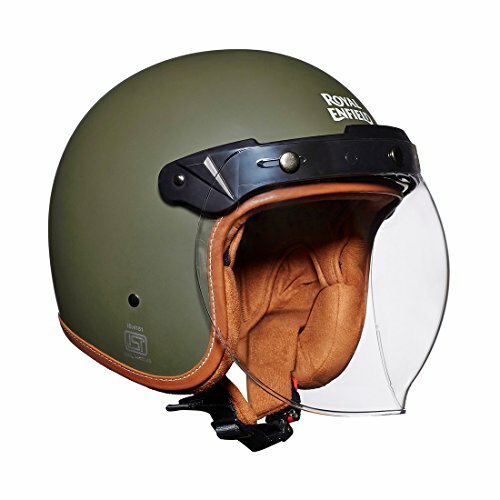 The designers at Royal Enfield Helmet facility take care of all the needs of a rider and this can be seen in the small details that they take care of while designing a helmet. In case of this helmet, it comes with a goggles holder, perfectly situated at the back, it has a snap button closure system. The helmet also comes with an integrated lockable D-ring in the chin strap which helps in locking the helmet easily. The helmet weighs around 1050 grams and comes with ISI (IS: 4151) and DOT (FMVSS No. 218) certification of quality and protection standards. The helmet comes with a single unit fiberglass shell which has superior impact absorption properties, it absorbs the impact of collision during an accident and distributes it across a large surface area, it helps in decreasing the chances of a potential head injury. The helmet features a single stitched leather trim on the periphery of the shell. To increase the scratch resistant property, the helmet has a hard coat of UV treatment on the shell surface. The visor has a hard coat of UV treatment which increases the resistivity to scratch to a high extent. The visor has a three snap button release mechanism which requires no tools to open. This helmet also offers a goggle holder on the back with a snap button closure. It also comes with a lockable D-ring which is integrated into the chin strap to help in locking the helmet. The classic chrome cover Royal Enfields are hard to miss on the road, this is all because they are made with a meticulous, detailed and perfected the process. Same goes with the SIGNATURE CHROME HELMET. The helmet weighs over 1000 grams and has an ISI (IS: 4151) and DOT (FMVSS No. 218) certification of quality. One thing to take care of in this helmet is the styling stickers that are applied over the chrome layer, they must be kept away from hard objects. For added protection, the helmet uses an expanded polystyrene inner lining, containing a combination of mesh and knit internals which helps in improving the performance. The visor used in this helmet is made of strong and flexible material and have a polycarbonate coat and UV treatment to make it resistant to scratch to some extent. The helmet has ISI certifications for quality standards. The chin strap of the helmet is adjustable and made up of nylon, the strap has a micrometric lock system. The outer shell of this helmet is made up of high-grade fiberglass and is covered with a denim cladding. This is a classic open face design and have adjustable straps made of nylon, the strap has a micrometric lock system. The helmet has uses a perfectly designed combination of mesh, polyester and denim internals to maximize the comfort levels of the rider. The internals can be easily removed and washed, they are also treated with anti-microbial. 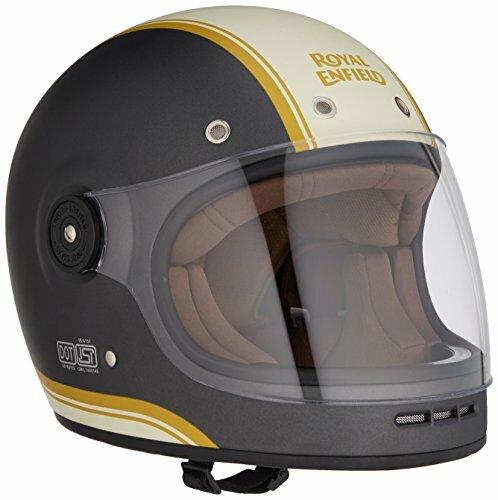 As the Royal Enfield 650 Twins are now available in India, the brand has updated their official store with their latest helmets, especially dedicated to the buyers of their two new products. These helmets are designed to match and magnify the looks of your bike and you yourself. The helmet weighs over 650 grams and comes with an ISI (IS: 4151) certification of quality and protection standards. The inner safety liner of the helmet is made up of Expanded Polystyrene foam. The visor of the helmet is an optically correct aviator style faced shield with micrometric stops which allow you to position the visor according to your preferences. The visor itself is made up of polycarbonate material, which provides its high strength and flexibility at the same time. The visor has a screw type release mechanism which allows you to open it when required without taking help of any tools.